"Being able to fly through the nebula's tapestry in three dimensions gives people a much better sense of what the universe is really like," explained the Space Telescope Science Institute's visualization scientist Frank Summers, who led the team that developed the movie. One of the sky's brightest nebulas, the Orion Nebula, is visible to the naked eye. It appears as the middle "star" in the sword of the constellation Orion, the Hunter, and is located about 1,350 light-years away. At only 2 million years old, the nebula is an ideal laboratory for studying young stars and stars that are still forming. It offers a glimpse of what might have happened when the Sun was born 4.6 billion years ago. 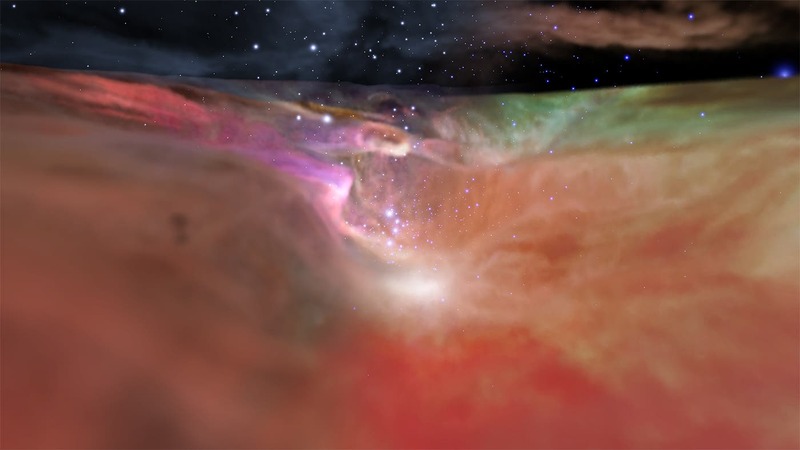 The image above showcases both the visible and infrared visualizations of the Orion Nebula. This movie demonstrates the power of multi-wavelength astronomy. It helps audiences understand how science is done — how and why astronomers use multiple regions of the electromagnetic spectrum to explore and learn about our universe. It is also whetting astronomers' appetites for what they will see with NASA's James Webb Space Telescope, which will show much finer details of the deeper, infrared features.